The LenovoT420s is an excellent laptop for business users, and also well worth the consideration of consumers who prefer an excellent keyboard and durable design to flashy aesthetics. The ThinkPad T Series is an elder among laptops. IBM introduced the first laptop in the line, the T20, about 12 years ago. Since then the series has been consistently updated and has never once been removed from the market. Only the ThinkPad X Series has enjoyed a similar tenure. IBM’s original T20 was offered only with a 14.1-inch display, but over the years the line has expanded. High performance and 15.6-inch variants were made available. More recently, Lenovo decided to spin off a thinner, lighter version — resulting in the T420s. Though this is the thin-and-light version of the T420, don’t mistake it for an Ultrabook. The 14.1-inch display and maximum thickness of just over one inch seemed modern when the original T400s arrived in 2009, but today it’s merely average. It does allow for a standard Core i5-2520M processor, however, which means performance should be much better than what is provided by today’s thinnest laptops. Lenovo is debuting an Ultrabook version of the T-Series, called the T430u, later this year. Which raises the question: Is the T420s a good choice, or is this thin and light losing ground to more modern designs? Let’s find out. When Lenovo took over the ThinkPad line from IBM there was widespread fear that the brand would be watered down. Instead, the company has remained shockingly stubborn. This T420s is thin, but its appearance is otherwise not much different than the laptops made ten years ago. From an aesthetic standpoint the use of matte black is a terrible choice, but that’s not the point. Functionality is the focus here. The expanses of non-gloss material ensure that fingerprints are rarely an issue. Dings and scratches also tend to be obscured. While a shiny new consumer laptop may look worse for wear a few years down the road, this laptop will display its scars with pride. The T420s’ designation as a thinner version of the T420 is literal. We’ve had the chance to see both, and the design elements are the same right down to the size of the display bezel, the hinges used and the location of the latch (yes, this laptop has a display latch, a feature long gone from consumer products). Connectivity is the only major change. Due to its thinner profile this laptop offers only three USB 2.0 ports, DisplayPort, VGA, Ethernet and a card reader. That’s down a couple ports to the normal T420, but it’s also much better than what is provided by most laptops of similar size. Better still, the ports are mostly along the rear of the laptop. That’s beneficial because it means peripheral cords are less likely to get in your way. Similarities between the T420 and T420s continue with the user interface. The keyboards on both appear to be identical, which means that the thinner model has the same excellent key feel. While most of the competitions — including HP’s own business-oriented Elitebooks — have transitioned over to island-style keyboards, Lenovo has continued on with beveled keys. The result is not as visually attractive, but we think this design is better for high-speed touch typing. Users new to the ThinkPad brand will undoubtedly be tripped up by the location of the function key, which is located where the Ctrl key is on every other keyboard ever produced. This strange layout has been used for years, so it’s unlikely to be changed soon. 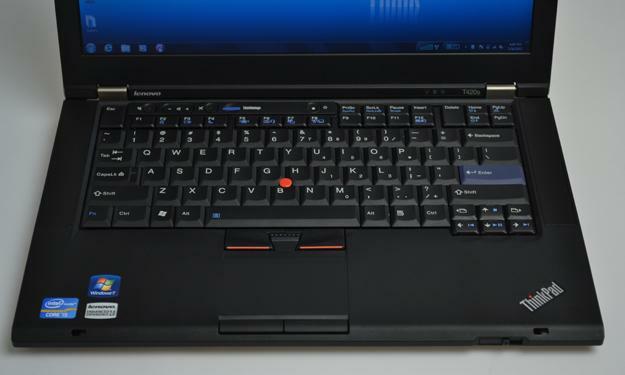 On the other hand, the T420s offers dedicated buttons for speaker mute, microphone mute and volume as well as double-sized Escape and Delete keys. These enhancements more than make up for the layout’s other oddities. The touchpad is extremely small for a laptop of this size. It’s obvious that you’re expected to use the trackpointer (a little red pointing stick in the middle of the keyboard) instead. Users who’ve never tackled a trackpointer before are bound to be confused by it, but there are benefits. Once you’ve become accustomed to it you can navigate via mouse without lifting your hands from the keyboard. The T420s is a business laptop, and as such it comes with a matte display, making it possible to use the laptop in many different environments. Even outdoors use is possible with the display’s brightness turned to maximum. Usually the downside to a matte display is less-than-stellar performance in movies and games, and that’s certainly the case here. You don’t get the “pop” of vibrant colors that you receive from a decent glossy laptop display. Performance in movies and games is still adequate, however — and better than matte displays we’ve seen in the past. Part of the reason for this may be the resolution of 1600x 900, which is high for a 14.1-inch display. Audio quality has never been a focus of the ThinkPad brand, but the sound the 420s emits is surprisingly adequate. It has all the typical laptop issues with bass and distortion, but maximum volume is sufficiently loud and clear. At idle, the fan of the T420s isn’t audible. At load, the fan spins up a bit, but still remains quiet. This is one of the least audible cooling systems that we’ve ever heard. You’d think that the low fan speed would result in warm operation, but that’s not the case. At idle most of the laptop’s surfaces are between 70 degrees and 80 degrees Fahrenheit, which is just barely above room temperature. Placing the laptop under load with a stress test did raise temperatures, but almost all surfaces remained under 90 degrees. The only potential source of discomfort is the left rear bottom of the laptop, which is where the exhaust is located. Temperatures here reached 103 degrees, which means that lap use could be uncomfortable if the processor is heavily stressed. Though built to be thin and light, the T420s isn’t the most portable laptop around. Its 14-inch display puts it at a disadvantage compared to 13.1-inch or 13.3-inch laptop. The laptop’s weight of about 3.9 pounds is far from classleading, as well. With that said, the T420s is reasonably small. It will fit in most bags that accommodate a 13.3-inch laptop and is light enough to tote around on a regular basis. 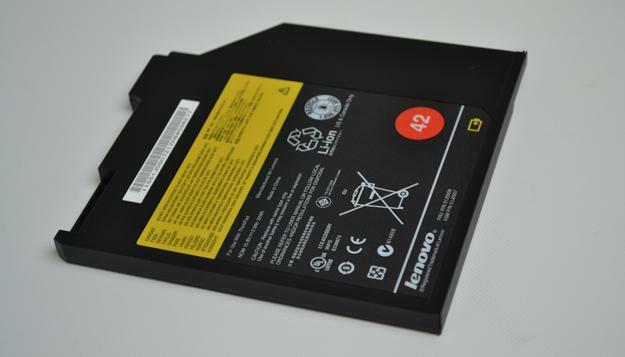 All ThinkPad T420s laptops come with a standard six-cell battery. In our Battery Eater’s Standard Test it lasted just one hour and nine minutes, but in the Reader’s Test is lasted a reasonable five hours and thirty two minutes. Typical mobile use will result in between four and five hours of endurance. That’s not bad, but it’s not great, either. If you need more life you can buy a three-cell bay battery for $120. This battery replaces the optical drive, which slides out using a fool-proof latch system. With the extended life battery installed, life in the Battery Eater Standard Test goes up to two hours and ten minutes and the Reader’s Test is extended to an impressive eight hours and thirty nine minutes. There’s an optional nine-cell battery for people who need even more life, but it was not provided with our review unit. As with other ThinkPads, our T420s came with Lenovo’s bundled ThinkVantage software. It includes a wide variety of software such as ThinkVantage Connections, which is a replacement to the standard Windows wireless manager. Unlike most such bundled solutions, the software offered by Lenovo is actually better than the standard Windows solution. This is also true for the Power Manager. Not everything about the included software is great, however. Lenovo includes advertisements for other ThinkVantage services in portions of the bundled software interface by default, which is annoying. In addition, the Virus Protection section recommends Norton Internet Security. It’d be more useful to recommend Microsoft’s free Security Essentials software. 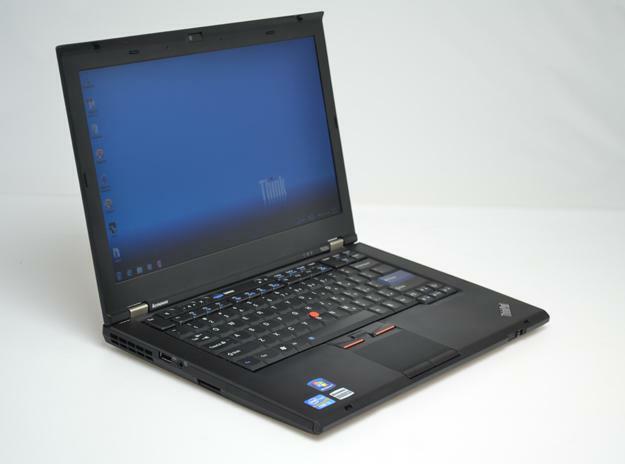 Though thin, the T420s is not so thin that it prevents the use of normal Core i5 processors. That’s a major advantage older and thicker ultraportables have over newer Ultrabooks, and its shows in the performance numbers. SiSoft Sandra’s Processor Arithmetic test achieved a combined score of 43.44, which sets a new record among the laptops we’ve reviewed. The 7-Zip score of 8,247 MIPS is also the highest we’ve yet recorded. Considering the strong processor performance, the score of 2,358 returned by PCMark 7 seems low. The reason for this, as mentioned in other reviews, is that PCMark 7 heavily favors solid state drives. If we take laptops equipped with SSDs out of the running the score of 2,358 is strong. Only the HP Envy 15 scored higher. Nvidia NVS 4200M discrete graphics can be had as an option, but our review unit did not come equipped with it. Instead it relies on Intel’s HD 3000, which can’t run 3DMark 11. 3DMark 06 returned a score of 3,701, which is a bit low for a laptop of this configuration. Combine this with a 1600 x 900 display and you have recipe for terrible gaming performance. Even older 3D games will need to be played with many detail options turned off. No one has ever mistaken a ThinkPad for a gaming laptop, however, so the lack of 3D gaming prowess isn’t a problem. Overall performance from the T420s is extremely strong, held back only by the mechanical hard drive. Solid state drives are available as an option. We highly recommend them if you’re interested in maximum performance. The ThinkPad T420s is another example of Lenovo’s stubbornness. Besides the hardware, which is quick, there’s nothing about this laptop that is particularly modern. The entire design philosophy, from the boring matte black surfaces to the beveled key caps, could easily be at home on a laptop built five years ago. But being stubborn isn’t bad when you have it right. This is a laptop built for people who use their laptops for work every day, and for that use the T420s is perfect. It’s simply a miniaturized version of the T420, offering the same performance in a more portable package. While the T420 might be used around an office, the T420s can be taken nearly anywhere. You might expect to pay a higher price for the slimmer chassis, but that doesn’t seem to be the case. 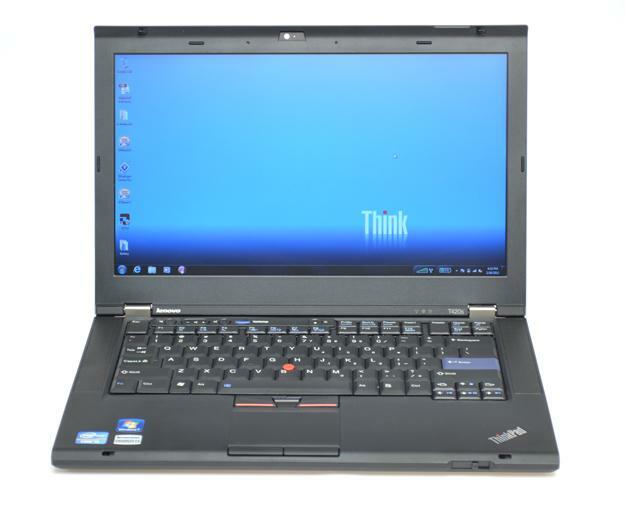 Right now our review unit can be yours for just $999, while a similar T420 is $949. That’s not much of a difference. The only weakness of the T420s is battery life. It’s not terrible, but it’s a little below average for a modern ultraportable. The included three-cell extended battery does extend life, but it requires the removal of the optical drive and is an additional cost. It’d be nice if this laptop managed six or seven hours in real-world use without additional juice. One minor disadvantage can’t spoil this party, however. The T420s is an excellent laptop for business users, and also well worth the consideration of consumers who prefer an excellent keyboard and durable design to flashy aesthetics.